TZA-7000DP is a multi application high power PA Amplifier with an inbuilt MP3 Digital Player. With a rated power handling capacity of 700 Watts (350 Watts power from each zone) it is an ideal music system for large PA Installations involving multiple speakers. This amplifier is designed to give high power, clean sound, and reliable, trouble free operation under extreme climatic & weather conditions. The high quality inbuilt MP3 player comes with backlit LCD display, a remote, and useful features like “Random Play” and repetition of only selected songs. Provision has been given for mixing MP3 music with various mic inputs, thus making this model ideally suited for DJs and other PA music programmes. Stereo Music Operation for DJ programmes. Built-in MP3 player with USB, SD, MMC card reader & FM Player. Remote control provided for ease of operation. 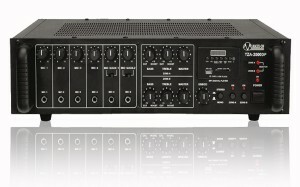 TZA-5000DP is a multi application 2-Zone PA Amplifier capable of delivering 250+250 Watts output. Ideal for PA Installations in mosque, temples and other religious places, as well as for other indoor and outdoor sound reinforcement applications. This amplifier has a built-in MP3 player with USB, SD and MMC card reader, which is ideal for DJ’s and stereo music applications for various gatherings. 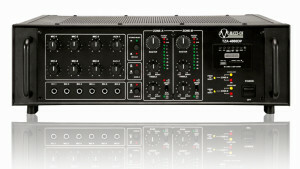 This amplifier is designed to give clean sound and reliable, trouble free operation under severe climatic conditions. Features includes 6 Mics, 2 Aux. Inputs and RCA jacks at rear for CD/DVD players. In addition, resettable circuit protector, ±10dB Cut/Boost Bass and Treble Controls and AC/24 Volts Battery operation are provided. 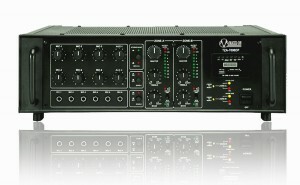 TZA-4000DP is a multi application 2-Zone PA Amplifier capable of delivering 200+200 Watts output. Ideal for PA Installations in mosque, temples and other religious places, as well as for other indoor and outdoor sound reinforcement applications. This amplifier has a built-in MP3 player with USB, SD and MMC card reader, which is ideal for DJ’s and stereo music applications for various gatherings. 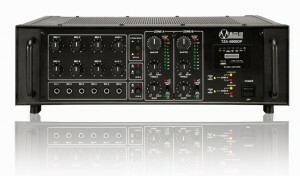 This amplifier is designed to give clean sound and reliable, trouble free operation under severe climatic conditions. Features includes 6 Mics, 2 Aux. Inputs and RCA jacks at rear for CD/DVD players. In addition, resettable circuit protector, ±10dB Cut/Boost Bass and Treble Controls and AC/24 Volts Battery operation are provided. TZA-2000DP is ideal for medium sized installations such as in places of worship where two separate groups of speakers are needed to be connected. This amplifier has a built-in MP3 player with USB, SD and MMC card reader. In addition, ±10dB Cut/Boost Bass and Treble Controls and Stereo music operation, connecting of two separate groups of speakers, line inputs & outputs, preamplifier outputs, zone On/Off facility, DC fuses at rear panel, AC/DC operation have been provided.